Tomatillo salsa is an easy homemade salsa made from fresh tomatillos, garlic, and jalapeno peppers. The perfect spicy dip recipe for any occasion. When I was trying to decide on this month’s fruit or vegetable for the Eating the Alphabet Challenge, I was reminded of those fun sounding little things called tomatillos. Are they a fruit or a vegetable? Well, like the well-known tomatoes are often called a vegetable but really are a fruit, tomatillos are the same; a fruit. They are pretty much a year-round staple here in Texas and used in many regional dishes. And I found out that they were grown as far back as 800 B.C. in Aztec cultures! Wow! 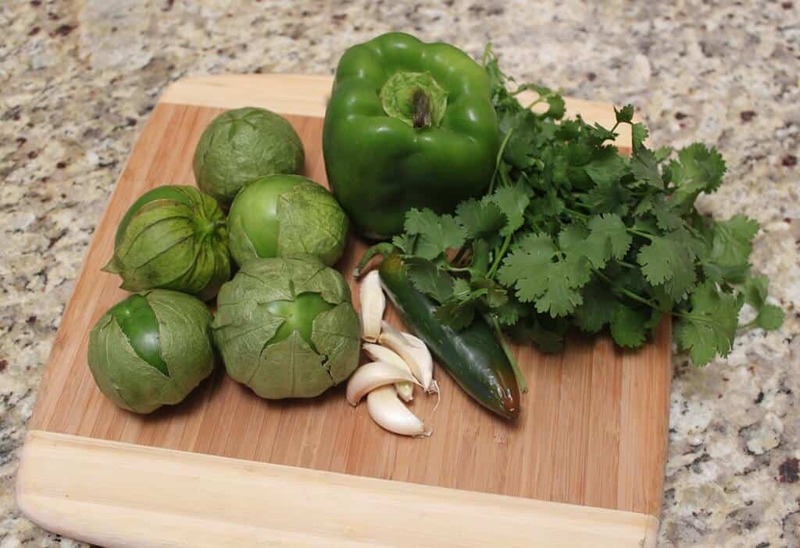 Tomatillos are low in calories and high in anti-oxidants, so they are a great choice to add to your cooking. My mother-in-law loves to go to a produce market near where she lives where she can talk shop with the owner and wheel and deal on produce for a great price. 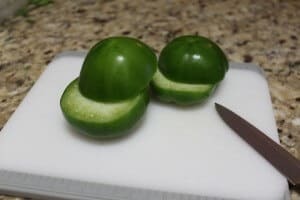 A couple of years ago, she and my daughter made this delicious and easy tomatillo salsa to use the tomatillos and bell peppers she had picked up at that market. We just could not get enough of it! 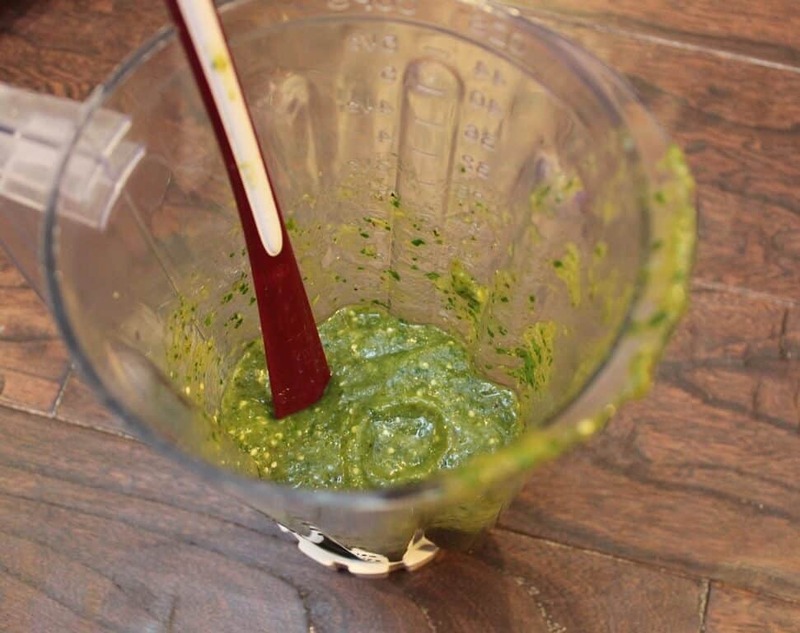 With only a few ingredients needed, tomatillo salsa is a cinch to make! I hadn’t had it in awhile and when I made it for this month’s Challenge I wondered why I don’t keep this as a staple in my refrigerator all the time! Again, I just could not get enough. 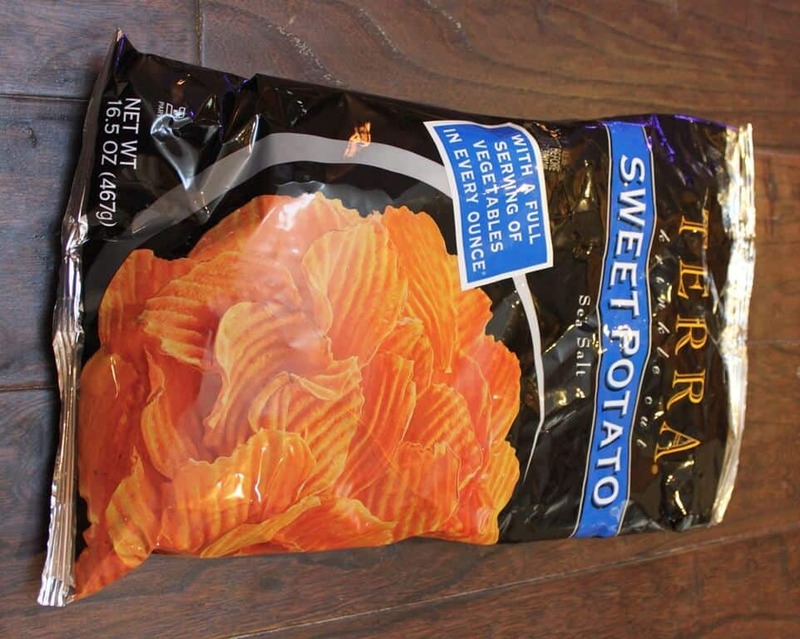 I served mine with sweet potato chips because a) I’m slightly addicted lately to these chips from Terra and 2) my family had eaten up the last of our regular tortilla chips before I reminded them I needed some for my photo. Oops! Never mind, I think the slightly sweet flavor of the sweet potato chips compliments the salty sour flavor of the salsa. 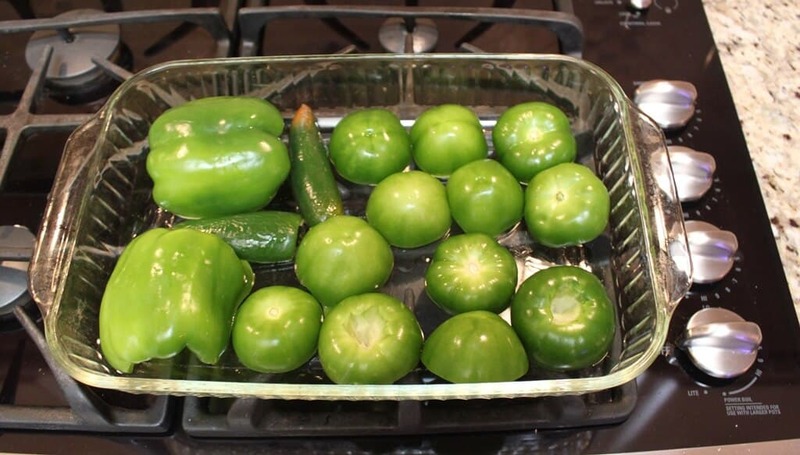 Below is the easy tomatillo recipe my mother-in-law uses. Although, I found a few online that are pretty similar, so feel free to tweak it to your own preferences—it’s pretty forgiving! Also, I decided to roast instead of steam the tomatillos, hoping to add a little bit of that roasted flavor to the finished salsa. Preheat oven to 400°. Remove papery covering on tomatillos and wash. Cut tomatillos in half horizontally. Slice bell pepper and jalapeno in half lengthwise. Place all produce cut side down in large roasting dish. Roast in oven for about 15 minutes, flipping items over about halfway through. Cool then puree all ingredients in blender. Tomatillo salsa gets even better tasting after it’s chilled a bit in the refrigerator and the flavors blend together. I hope you’ll give it a try sometime soon! 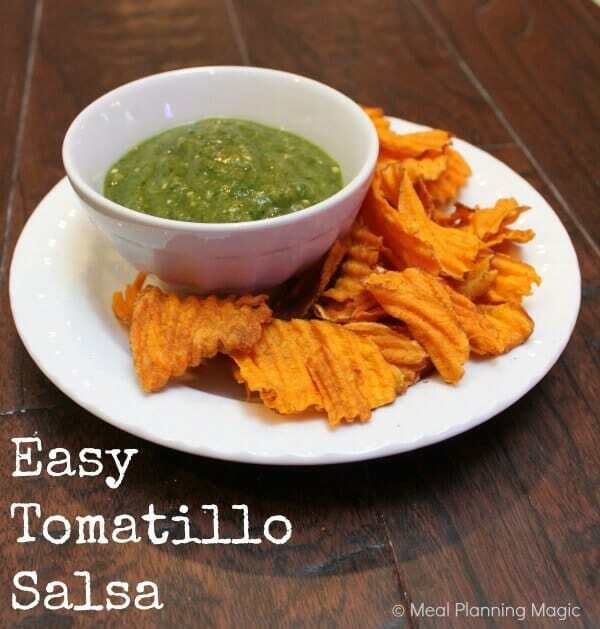 Blended up–simple as that and enjoyed with chips or on just about anything you like to have salsa on. All roasted and cooling, soon to be ready to blend up into a delcious salsa! Isn’t all this green just gorgeous? Cut the tomatillos in half HORIZONTALLY, so you can get some yummy roasted-ness going on. Just five ingredients (plus salt to taste)–that’s all it takes to make fresh tomatillo salsa. Simple! 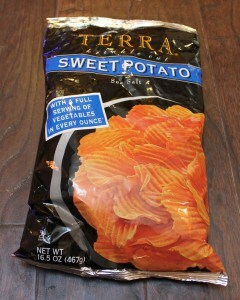 These are my current favorite sweet potato chips. They’re actually pretty low in fat and calores and only a couple of ingredients. Yum! Or you could make your own. So, what’s your family’s favorite fruit or vegetable that starts with the letter P, Q or R? Please share with us in the comments below! Bloggers, I’d love for you to join our Eating the Alphabet Challenge. Follow us on Twitter too using the hashtag #EatingAtoZChallenge. Click here for details and to complete the form to sign up. And be sure to check out all these other fabulous blogger’s interpretations of the letter M. N or O—fruit, veggie or grain-style–this month by visiting the blogs below! I know I’m planning to try a few. This looks lovely. I’ve only eaten tomatillos once before, and they were delicious. I can’t buy them anywhere fresh though, I had to import a tin of them on the internet. I wish they were more readily available where I come from! 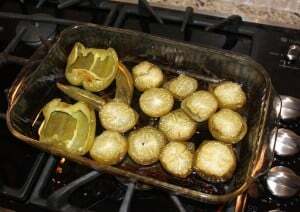 I love how you roasted the tomatillos. I love tomatillo salsa but have never made it myself before. I bet it was really good with the sweet potato chips. I’ve never actually cooked with tomatillos before, to be honest. They’re actually very rarely available here in Southern Ontario. Yes, I guess being in southeast Texas, they’re pretty much a staple here since we’re so close to Mexico (and in my research I found that much of the U.S. supply is grown in Texas!) If you ever get a chance to try them you should!